Università degli Studi di Bari ‘Aldo Moro’ (UniBA) is one of the 58 State universities established by a Decree of October 9th, 1924 on the foundations of the ancient University Schools of Pharmacy and Notaries. In May 2008, the Academic Senate unanimously decided to name the University of Bari after Aldo Moro. 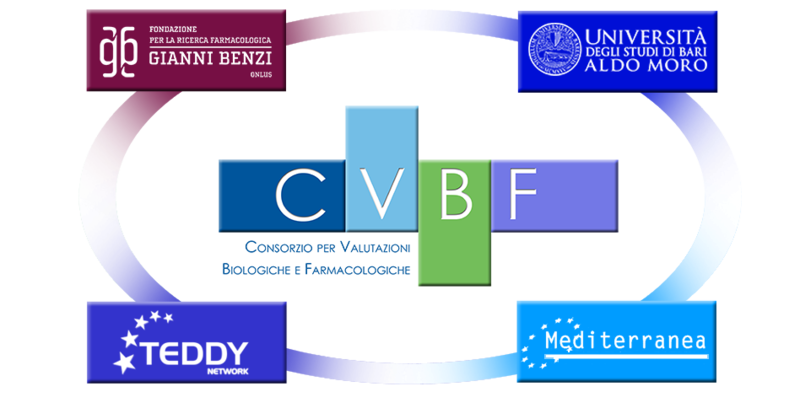 On December 13th, 2011 the university’s Board of Directors decided to join CVBF. Fondazione per la Ricerca Farmacologica Gianni Benzi Onlus (FGB) is a registered not-for-profit scientific research organisation, established on November 9th 2007. The mission of the foundation is to uphold the ideas and continue the work of Professor Gianmartino Benzi in the fields of pharmacological research and regulatory science in Europe and in the promotion of an ethical and safe use of pharmaceutical products, including the fight against doping. TEDDY – Network of Excellence for Paediatric Clinical Research (TEDDY) was funded in 2005 as a Network of Excellence responding to a call published by the European Commission and aimed at “structuring efforts devoted to the development of medicines tailored for children”. In 2018, TEDDY has assumed a legal status to be fully represented in the European paediatric research framework. Mediterranea – Associazione per lo sviluppo locale (MEDITERRANEA) works, since 1992, to promote the dissemination and implementation of Community policies aimed at encouraging and promoting local development. He took over in November 2001 the legal status of “social promotion association” and obtained in the following year the acknowledgment of legal entity.